The goal of the Adopt-A-Stop program is to create litter free bus stops throughout the City of Charleston. Adopt-A-Stop volunteers have the opportunity to adopt an unsheltered CARTA bus stop within the City. Once an adoption application is approved, KCB will drop off a trash can and volunteer supplies. Keep Charleston Beautiful will provide one painted trash barrel and lid, trash bags, gloves, safety vests, pick-up sticks, and all other need materials. Adopters agree to service the can and pick up litter at the stop once a week for the duration of the year. KCB asks adopters to submit a simple 4 question Cleanup Report Form at the end of each month. 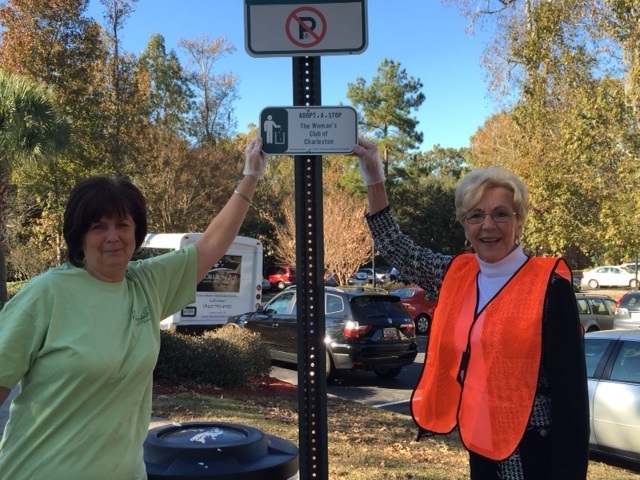 In exchange for their efforts, adopters receive a recognition sign at the bus stop. Adopt-A-Stop is a litter reduction partnership between KCB and CARTA. Funding for the program was provided by the LOWE'S/Keep America Beautiful 2014 Community Improvement Grant. The program relies on volunteer involvement from residential and community businesses, organizations, and individuals. Adoption opportunities are for bus stop locations that do not currently have shelters, as those are maintained by CARTA. CARTA will provide one Adopt-A-Stop sign identifying the adopting organization, company, family, individual, or group. Who can apply? Anyone can adopt a CARTA bus stop or stops: groups, individuals, private companies, public agencies, churches, schools, school groups, civic organizations/groups, scout groups, and more. How long is the contract? One year with a minimum of 1 visit a week. Are there any rules or regulations? Volunteers agree to empty the trash can and pick up litter around the designated bus stop once a week for the length of the adoption term. KCB asks volunteers return the unused supplies after the adoption term. Volunteers are asked not to plant flowers, paint or alter the bus stop in any way. Can I choose my bus stop? You may choose a bus stop within the City of Charleston without a shelter. We will inform you of your requested bus stop’s availability. If that bus stop is not available we will provide other options. Can I paint the trash can? KCB will provide you with a student painted can for your stop. If you would like to paint your can that is possible, provided the can illustrates the theme "A beautiful Charleston" and is not used for advertisement purposes. Why Adopt-a-Stop? The Adopt-A-Stop program is a great way to get involved in the community. Adopting a bus stop helps make the community more beautiful while protecting the environment. Everyone benefits from this program–property owner, businesses, visitors and transit riders. As an added bonus you will be recognized by CARTA at that stop. What does the recognition sign look like? Adopt A Stop today by filling out our registration form!